When Québec’s law banning smoking in public places took effect on May 31, 2006, bar owners across Montréal braced for a hit — with good reason. The province and its metropolis contain a higher percentage of smokers (roughly one-third) than do other parts of Canada, making a burg such as New York City (at 19 percent smokers) look positively ruddy and robust. Though Montréal residents overwhelmingly approve of the ban, bar owners have continued to fight: In 2006, the Union des tenanciers des bars du Québec sought an injunction against the ban. It failed, establishing a legal precedent. For good or ill, it seems smokeless bar culture in the sin cité of the north is here to stay. With one small, crucial exception: the cigar bar. The tiny handful of such lounges that were operating before May 10, 2005 — most of those downtown — was exempted from the ban, since the Québec National Assembly didn’t want to ruin highly specialized businesses that depend disproportionately on selling cigars and smoking paraphernalia for their livelihood. That’s worked out just fine for the Whisky Café, which has maintained a successful presence in one of the more remote and industrial stretches of the north-south, city-spanning boulevard Saint-Laurent since 1989. A year away from the café’s 20th anniversary, business is booming. Any bar-restaurant that manages to survive nearly two decades must have something remarkable to offer. But as this reporter’s walk north from the Old Port stretches into its third mile, location doesn’t appear to be Whisky Café’s biggest asset. Even along a boulevard as wildly diverse as Saint-Laurent — with its tony shops and bistros on one block and deserted parking lots and shuttered warehouses on the next — the café’s corner on Bernard seems particularly unlikely for one of the most sought-after watering holes in the city. Even during the day, the neighborhood is slightly spooky, and the elevated highway a few hundred yards to the south has the strange distinction of shielding light while amplifying traffic noise. On this early evening visit, rain and shadows make the setting resemble an undiscovered Edward Hopper painting, and it’s a relief to close the café door on the fall chill. Once we’re inside, the polished-wood interior — with its dimpled black-leather seating, dark-red walls and substantial-looking, louvered window shutters — generates a welcome sense of clubby civility. An inverted L-shape, the café’s space begins with a lounge consisting of a half-dozen or so small tables and four large banquettes set against a wall of windows. The bar, at the far end, faces another small seating area and ends just a few feet from a pair of swinging doors emblazoned in gold letters with “Le Salon Cigare.” The overall style is an amalgam of subdued ornamentation and clean surfaces, as if the bar was once stuffy and reserved but its frilly treatments wore off over the years. Like many such establishments, it makes bottles a component of its décor; here they’re arranged not just behind the bar but also in lighted cabinets around the room. “We have over 500 different kinds of alcohol,” says a cheerful-looking man behind the bar as he portions drops of milk into an espresso. 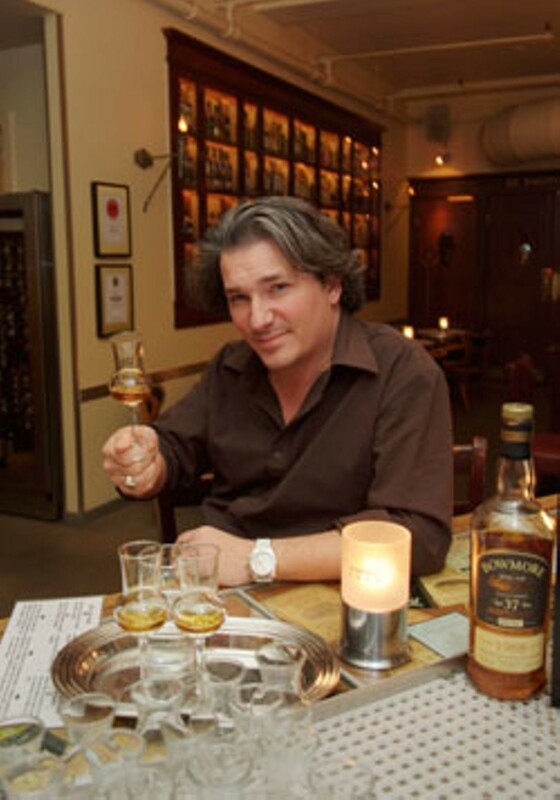 “Gotta put ’em somewhere.” He introduces himself as Simon Beaulieu, the Whisky Café’s evocatively titled conseiller (in English, advisor or counselor). Beaulieu has been working here since the day the doors opened, and he’s watched as a then-brash experiment in food-meets-cigars-meets-lounge became something of a city institution. Beaulieu hands over the food-and-drink menu: page after page of American, Irish and Scotch whiskys, ports, sherries, grappas, beer and wine selections. Among that expansive array are no fewer than 150 single-malt Scotch whiskys. The “single” in single malt means two things: It’s the product of just one distillery (as opposed to multi-distillery blends such as Dewar’s and Bell’s), and only malted barley is used as the grain ingredient. Meeting these requirements doesn’t necessarily make single malts superior to their blended cousins, but it is usually a reliable indicator of quality. Here, absurdly wonderful and rarely seen varieties festoon the back bar, including a 1978 Benrinnes (a.k.a. “The Ben”) from Scotland’s rugged Moray region; a 1973 Auchentoshan, produced by one of the few single-malt lowland Scotch distilleries; and a relatively youthful (10-year-old) BenRiach Curiositas, a notoriously peaty but smooth and sparsely produced gem from the fabled maker in the Speyside region. Single malts vary in price from $11 for 10-year-old Aberlour to $250 for 37-year-old Bowmore, but most can be had for about $20. Discreetly tucked at the back of the menu are 11 food selections, all served cold in appetizer portions. Beaulieu points out that each was chosen as an accompaniment to a particular type of drink, and recommends the smoked salmon listing as an example. “You’ve got to try this,” he says, and returns in a few minutes with a simple white plate holding a deck-of-cards-sized collection of beautiful, pink smoked-fillet slices. Served with baked baguette, chopped onion, lemon wedges and capers, the salmon is butter-soft and refreshingly undersmoked. A moment later, a small stemmed glass with two fingers of Ardbeg Scotch appears. “Here’s your smoke,” Beaulieu says as he wipes the glass. Peat fire can impart a special flavor to Scotch, and those who love it often wax poetic about the glories of varieties such as Laphroaig. But the remote distillery of Ardbeg produces a single malt that — while unquestionably superb — is smoky to the point of being overpowering. Unless, that is, you temper it with food, and this stir of whisky and salmon manages to make both taste even better. Next comes a plate of roasted magret duck breast wrapped around a walnut-sized center of foie gras and served with a confit of onions and the same sliced baguette. The recommended accompaniment is a Domaine Valcros Banyuls, a fortified red dessert wine made with 100 percent grenache grapes. The duck, like the salmon, seems to have been subdued by the chef, with little of the usual game-bird flavor. The foie gras contributes texture, but its taste doesn’t overwhelm, either. It’s all perfectly acceptable, but would be a disappointment if not for the Banyuls. The wine’s balance of sweet, tart and acid notes makes the duck warmer and more complex on the palate, and creates a hint of unexpected, almost-grilled-steak flavor in the foie gras. The other food items on the menu also come paired with drinks: cheese plate with Cruz LGB Port; chocolates with Warre’s Tawny Port; foie gras with Paul Goerg champagne; cantucinni (Italian biscuits) with Frescobaldi Pomino Vin Santo rosé wine; and caviar with, of course, champagne (taster’s choice). Dish and drink pairings average about $25, with the noteworthy exception of the caviar/champagne ($150). With a 15-year-old Glenfarclas single malt in hand, we strolled into the cigar lounge. City law requires it to be a separate area, and Whisky Café’s smoking parlor is a small, 10-table anteroom that features a slightly lighter-red color scheme, the same black-leather seating and a discreet display case. In contrast to the masters-of-the-universe aesthetic that prevails in many cigar lounges — complete with turkey-platter-sized ashtrays, hunting club paintings and rows of private cigar lockers — this one is modest, comfortable and airy. One glance at the case is a happy reminder that the Cuban trade embargo that has infuriated U.S. cigar lovers for 48 years is powerless here. Though many cigar pundits attribute the appeal of Cuban varieties to the mere fact of their being forbidden in the States, the consensus among most aficionados — including this one — is that the island’s (mostly) lovingly preserved terroir produces varieties with a sweeter, richer flavor, and often higher nicotine content, to boot. 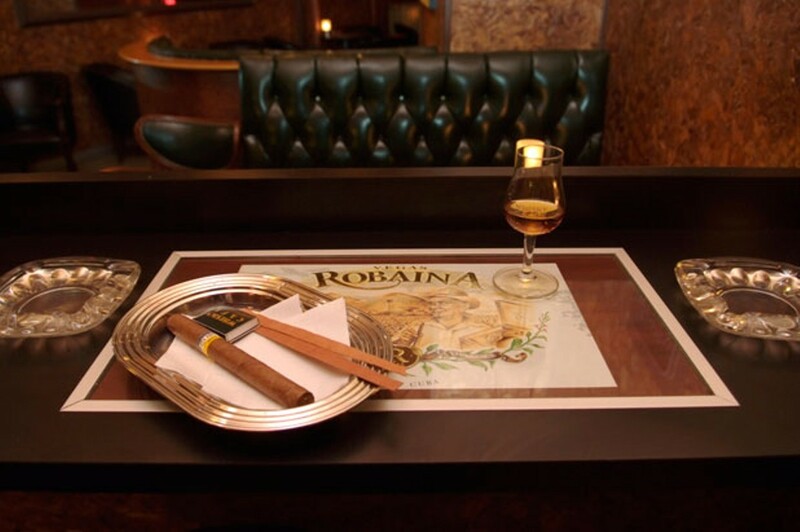 Monte Cristo #4 ($35), Hoyo de Monterey ($35), Cohiba Esplendido ($95) and Rafael Gonzalez ($14), along with eight other Cuban smokes, reside there . . . willing and legal. Thirteen others from the Dominican Republic, Brazil, the EU and elsewhere are available as well, but this visit just has to end with a Rafael Gonzalez. Beautifully made but reasonably priced, this brand deteriorates very quickly if not well stored, so the choice is, in part, a spot humidor test. This thinnish panatela (a long, slender cigar) turns out to have the classic Cuban bite so sadly lacking in its Honduran-made cousin, but also features the latter’s wonderful peanut-and-vanilla flavor. It’s remained perfectly textured in storage. As the ash end grows and the Scotch glass empties to dregs, living unhealthfully in sin city strikes this reviewer as the perfect antidote to U.S. stress — and as a reminder that the urge to splurge abides, tough times or no. Whisky Café is at 5800 Boulevard Saint-Laurent, Montréal. 514-278-2646, www.whiskycafe.com. Open Monday to Friday, 5 p.m. - 3 a.m., Saturday, 6 p.m. - 3 a.m., and Sunday, 7 p.m. - 3 a.m.